After attending a number of career fairs over the past few months, I am astonished at some of the outfit choices that were made for these events. I’m talking jeans and hoodies for guys, and tight-fitting dresses with high stiletto heels for girls. I wanted to say, “People, this is not a club or your living room, THIS IS A CAREER FAIR.” I can’t tell you how much your outfit matters. Before we get to talk to you at these events, we see you. We look at what you are wearing and we make inferences about you! The answer is quite simple. 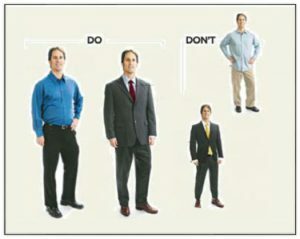 If you don’t know what to wear, stick with a business professional look, unless stated otherwise. For your outfit, you can never go wrong with a suit. Skirt suits are great for women, and tend to be the more conservative option. Be sure the skirt hits at the knee or right above. 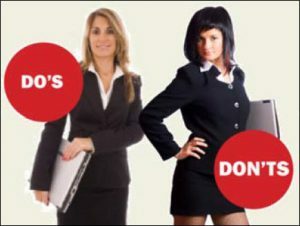 If a recruiter is distracted by your potential wardrobe malfunction, they most likely aren’t listening to you, and they will definitely remember you as the inappropriately dressed one at the career fair! Men, suits are the perfect option for you as well. A well-fitting suit is a great way to impress recruiters. With that said, make sure your suit is tailored to you. A suit that is too tight is distracting and awkward. Too loose and it makes you look sloppy! Ladies, you are not going to the bar/club or to a party. Be very cognizant about how short your skirts are, how tight your clothes are, and how much skin you are showing. You do not want to be provocative, you want to be professional! I can’t tell you how many bodycon dresses, tight skirts, and stiletto heels I have seen. That brings me to your shoes. If you choose to wear heels, pick a heel that is 2-3 inches in height. The more conservative the better. Gentlemen, I have seen too many of you show up in jeans and a sweater. Step up your game with a nice suit! I’m going to repeat myself here, but make sure your pants are not too tight. I see this way too often: they are too tight and too short. If I can see your socks, that’s a problem. 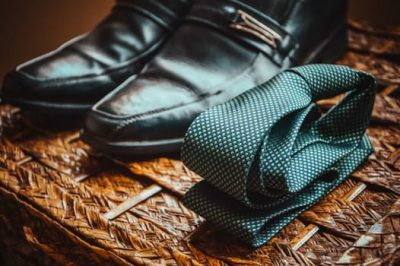 Make sure your shirt and tie coordinate, and your shoes are clean and polished. What If I Can’t Afford A Suit? Suits can definitely get pricey, but you don’t have to break the bank. Try the sale rack at Macy’s, or head to Marshall’s or Ross. They have good looking attire at very affordable prices. You could also try consignment shops or resale websites. At the end of the day, a good suit is an investment that will truly pay off! For more information, contact me at sandhuj@surgent.com. For more tips for success, subscribe to Passing Insights, the Surgent CPA Review blog.